Figure 1: X-ray CT scan of Sutter’s Mill meteorite fragment. 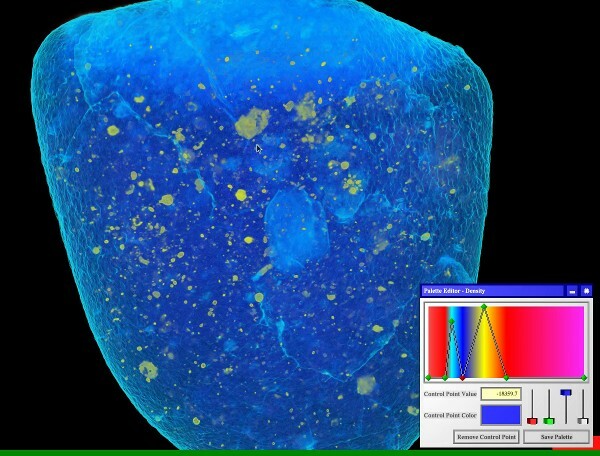 To quickly recap from my original post, the CAT scan of this meteorite fragment was taken at the UC Davis Center for Molecular and Genomic Imaging, and then handed to me for visualization by Prof. Qing-zhu Yin of the UC Davis Department of Geology. The movies I made were to go along with the publication of Qing-zhu’s and his co-authors’ paper in Science. I thought I did a really good job with the color map, given that that’s not normally my forte. The icy blue — dark blue gradient nicely brings out the fractures in the crust, and the heavy element inclusions stand out prominently in gold (Blue and gold? UC Davis? Get it?). You can watch the full video on YouTube. I’d link to Qing-zhu’s own copy of the video, but it has cooties, I mean ads on it, eww. And as can be seen in a full-page ad on page 31 of the same issue of Microscopy Today, apparently my picture — no doubt by virtue of the 3D meteorite fragment scan shown in it — was one of the winners in a “coolest thing you’ve never seen” contest held by the company who made the X-ray CT scanner. My little picture is Miss September 2013. Hooray, I guess? This entry was posted in Scientific Visualization and tagged 3D Visualizer, CAT scan, Color map, Transfer function, UC Davis, Volume rendering, Vrui by okreylos. Bookmark the permalink.